A sentence that tells us something is a statement. But sometimes we include a question into statement, in order to ask for information indirectly or when we report question. This is called included question into statement. Read the rest of article to know how to form Included Question in Statement. When we include a statement into a direct question. Or to discuss a question without directly asking it. Note: An included question in statement is always a noun clause. It is the object of the verb of phrase which is used as modifier. The noun clause must be always in the word order: Subject + verb. So, a noun clause can never be in the form of a question. I don’t know where the bank is. How to change a direct question into included question in statement? 1. We can use the following phrases to change a direct question into included question in statement. We need to find out…. I’d like to find out…..
2. We use a period not a question mark at the end of the it. Moreover, if it contains auxiliary verb such as “do, does, and did” we omit the auxiliary verb and change it to its appropriate form. Consider the examples below. When did he pass the test? I wonder when he passed the test. I would like to know what she said. 3. If the direct question contains an auxiliary verb or the verb “to be”, reverse the positions of the subject and the auxiliary verb. I need to find out what the answer was. 4. If it is a yes/no question, such as “Is he a doctor? Then in included question in statement the phrase begins with “if or whether “. I don’t know whether you could help me. 5. 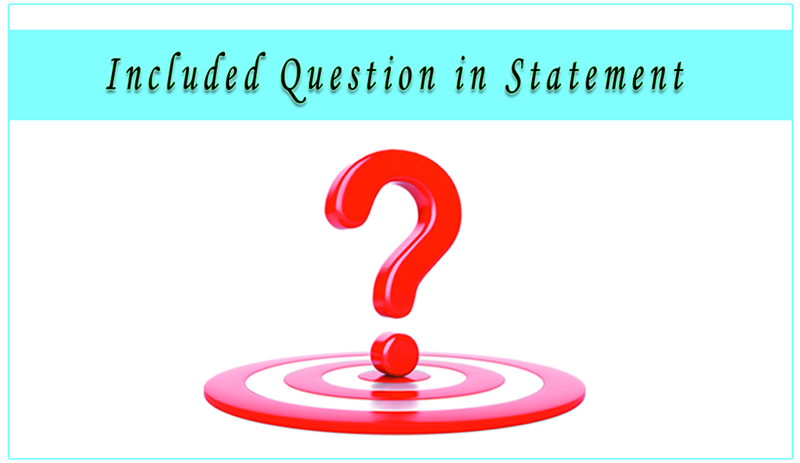 In included question in statement the infinitive can follow a question word. Please tell us what we should do. Please tell us what to do. When to use included question in statement? 1. As it’s mentioned in first paragraph, in order to ask for information indirectly or politely, the native English speakers prefer to use included question in statement. I would like to know what your name is. 2. When talking about something which is unknown to the speaker, then the speaker prefers to use included question in statement. Why did the students decide not to take their exam tomorrow? I don’t know why the students decided not to take their exam tomorrow? I hope the article that I have written above about benefit you, and you can use it in your daily conversation so on. We recommend you to click here to read about included question in question.